“I always supported Turkey’s EU accession,” acknowledged Martin Schulz, the European socialist candidate. “But at the moment the country is dramatically distancing itself from the EU’s democratic values,” he added in reference to the government’s attempts at gagging Twitter, the US-based social media platform. Countries that ban Twitter-use are not fit for EU-accession, was the resounding position voiced by the two top candidates from Europe’s biggest EU political groups during a final debate on Tuesday (20 May). “Turkish Prime Minister Recep Tayyip Erdo?an should concern himself more with the democratic conditions in his own country, rather than trying to teach other countries lessons,” Schulz added in response to criticisms levelled at German President Joachim Gauck. The SPD politician was alluding to a controversial statement made by the Turkish Prime Minister who called the German President “priest” after Gauck warned that democracy was “at risk” in Turkey. Both Jean-Claude Juncker from the European People’s Party (EPP) and Schulz, the top candidate for the Party of European Socialists (PES), focused on winning back voter confidence during the so-called “Wahlarena” (election arena), which was broadcasted on Germany’s largest public television station ARD. “The Europeans have lost trust in the EU,” Schulz declared. Instead of pointing out political alternatives, both candidates stood up against questions from roughly 200 participants in the studio’s audience. The traditional American townhall-style debate allowed attendees to pose their own questions in place of moderators. Most participants were selected with the help of the pollster Infratest dimap, charged with ensuring a representative sample was taken from the German population. Questions centered on the trade talks currently underway between Europe and America, the NSA spying scandal and the thriving Brussels lobbying sphere, revealing the distance between German citizens and the EU. The planned Transatlantic Trade and Investment Partnership (TTIP) dominated the evening’s issues. 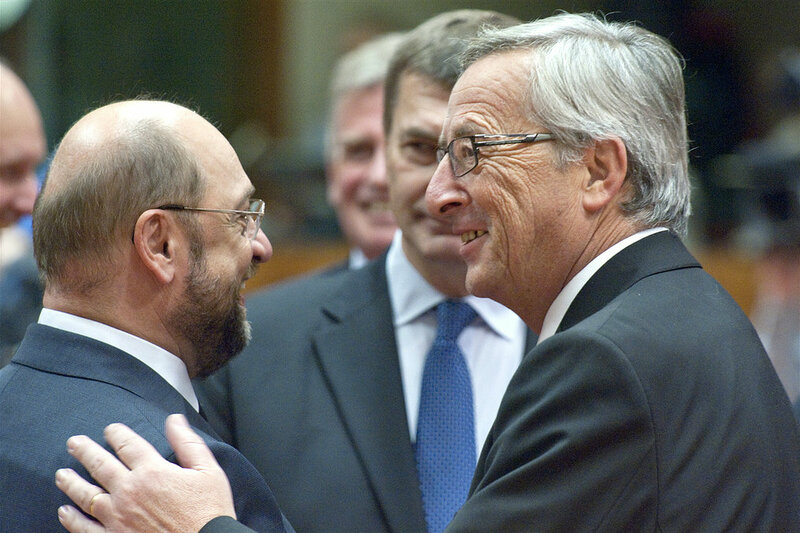 Both Juncker and Schulz fundamentally spoke in support of the agreement – provided that the United States agrees to respect the EU’s prized standards, they emphasised. “We must negotiate at eye level. We must not drop our trousers during talks with the Americans,” said Juncker. The EU must negotiate a tough stance, he said, but only if it comes with advantages for Europeans. But it was precisely this point which triggered discontent among studio viewers: What if the United States is still able to assert its will or what if it deceives the EU again, as was the case with the NSA scandal? Here, Schulz called for more “trust” and pointed out the strength of the EU, whose combined influence is stronger than each state individually. The president of the European Parliament particularly emphasised the assembly’s ability to assert its own interests. “After all, we rejected the SWIFT banking data exchange agreement, the agreement on Passenger Name Records (PNR) and we also said ‘no’ to ACTA,” Schulz recalled. As Commission president, the SPD politician hopes to make TTIP talks more transparent and assemble an advisory council comprised of civil society groups, unions and organisations, conducting open discussions in parallel to the negotiations. Juncker reaffirmed that European standards, including those for European data protection, would not suffer under TTIP. “Our data protection is not negotiable. The Americans must also listen to us from time to time and not always listen in on us,” said the EPP top candidate. Both candidates actively sought to dispel apprehensions that, under the TTIP agreement, necessities like water, soil and food would end up in the hands of private companies. Basic necessities belong in the public domain, namely under the authority of the communities, Schulz added. “There, the EU should also keep its hands off,” he said. Next to the United States and private corporations, Brussels lobbyists were also considered a thorn in the side among audience members. But Schulz also called for more transparency from politicians themselves: MEPs should take on the responsibility of revealing which lobbyists they speak to and when, he said. Juncker, on the other hand, did not approve of more transparency in the European Council. “Heads of state and government must be allowed to speak confidentially. That is important,” said the former Luxembourg Prime Minister. At the end of the televised debate, the two rivals were asked to name three wishes they would redeem as Commission president. Martin Schulz seized the chance to rattle off his party’s election agenda. “I want to fight youth unemployment, initiate measures against tax evasion and make Europe a stronger international diplomatic power,” the social democrat said. Over the next few years, Juncker said he would create 3 million jobs by bolstering the common digital market. In addition, the EPP politician said he intended to bundle European defence policy and implement a harmonised, EU-wide assessment basis for taxing companies.